Super Junior takes the cake for a lot of things — for their number of members; for enticing one of the strongest movements ever impassioned by any fandom; for having their leader single-handedly almost monopolize every variety show on air. But aside from all that, they also take the cake for being one of the longest running contemporary idol groups today. Amongst all the drama, member changes and regression in quality, Super Junior is reaching 8 years, and their latest concert Super Show 5 kicked off with a bang in Seoul on the 23rd of March. Super Shows have always been a quintessential and telling part of the K-pop experience, both from a fan point of view, and a non-fan point of view. In terms of its sheer scale, it certainly lives up to its name. With a massive set-list as well as an array of special performances, Super Shows, just like Super Junior itself, pretty much boils the K-pop experience down to its most basic essential, which is: never take it too seriously. There’s a sense of finality about SS5 though, that wasn’t even apparent in Super Junior’s last lacklustre “World Tour” for SS4. It’s not just the fact they actually seem to be embracing the “World” concept and heading down to South America for a leg of their tour, but everything from the content to the build up. It’s not to say that Super Junior are going to announce their disbandment once SS5’s run is over, but rather that there is a reverberating awareness that the end is now a very foreseeable and inevitable possibility. From the heavy inclusion of Henry and Zhou Mi (celebration circle! ), to the hour long LINE chat session held for fans preceding the concert (featuring all active members! ), to even resident ex-member and professional hobo Kim Kibum being spotted attending the opening concert. Whilst most K-pop concert experiences are all about the sonic and visual stimulations of seeing your idols exist in your immediate reality, Super Shows have always seemed to go that extra mile to make them truly memorable nights. They’re K-pop kitsch, in the best way possible. 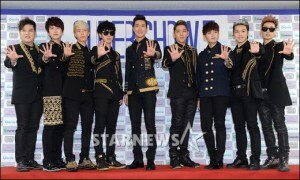 With the members reaching their prime one by one, SS5 has seen almost any semblance of sobriety thrown out the window. One look at the set-list and the song choices themselves boast the kind of direction Super Junior takes with their Super Shows: for example, the ballads have either been thrown away to KRY, or compartmentalized into one performance; no doubt just to get them over with to make room for more VCRs and fun uptempos. So true to who they are, there will always be at least one set where the boys dress up in ridiculous costumes and make room for painful name puns such as Marilyn Minroe. For this round, the entirety of Super Junior hijacked an otherwise unknown KRY OST track “Dreaming Hero” and used it as a means to dress up in costumes scaling various levels of farce. What’s interesting is that Super Junior chose to forego performing some of their more well-known (and let’s be honest, much better) songs such as “Superman” (tragedy), in favour of performing a discrete KRY OST. Which, until I saw pictures of Yesung as Captain Hook flooding my dash, I didn’t even know existed. It’s a prime example of Super Junior constructing everything they do, with a core of entertaining and being entertained. There’s no other reasonable conclusion as to why they’d randomly choose to sing a not-very-good KRY song, other than the fact they needed an excuse to loosely dress up as superheroes without it actually taking away from the legitimacy of the performance. Loosely meaning very loosely. No idea if Kyuhyun has been reading misconstructed Avengers fanfiction or something, but in no world is Loki a superhero. At least his was an attempt though. Zhou Mi obviously didn’t think the theme through when he decided to go as Woody. Sure, they could have used the more apt “Superman” as a reason to cosplay as superheroes; but considering the magnitude of awesome the “Superman” performances usually are, that’d be a cheap shot, even at Super Show level. Previously, just like most idol concerts held, Super Shows have always had moments for the individual members to embrace the limelight. Otherwise — and this isn’t to say he’s anything close to being a respectable singer or anything — who would’ve known that Heechul had a semblance of a voice? However, almost as if to reinstate that the concert is about the fans and the group as an entity, this time, for SS5 a majority of the members had their solo performances either conjoined, or cut out. Considering the amount of group songs (and SJ-M only songs!) being sung, it makes sense to condense things to make time, reserving solo priority to those leaving for the army this year (Yesung), and those just returning from the army (Kangin). There are a fair share of qualms to be had about this, though. Since idol concerts have always been a great way to showcase individual talents; these cutbacks seem to reflect that the shows are going against some kind of greater purpose. But It’s all done for the fans — I’m sure whilst there are hundreds of fans who would kill to see a Siwon solo song, there are also hundreds that’d rather douse themselves in acid. Most likely the priority was given to going the safe route with something every ELF would unanimously like to see. Which obviously they concluded to being four members — Kangin, Ryeowook, Siwon, and Sungmin — crossdressing and performing as Ga-in, Bada, Son Dambi, and Hyuna (of course) respectively. Please take note that they aren’t even singing the songs. They’re simply standing on stage in drag and trying to move in heels. Obviously Seoulbeats wouldn’t be Seoulbeats if we didn’t overanalyse every single implication of this performance, and we definitely wouldn’t be us if we hadn’t already done it before. Regardless, it’s interesting to note how this drag show highlights simply, how absurd girl-group choreographies can be. At first glance, the non-choreography the boys attempt during their joint ‘Alone’ performance appears downright pathetic. That is, until you realise what they’re doing is in fact the actual choreography. It’s not until you see Kangin excruciatingly trying to pull it off that you realise how inane and aberrant girl-group choreography tends to be, simply for the sake of “sexiness”. The fact that SISTAR had to perform that numerous times weekly, and in heels, makes my joints hurt just thinking about it. Nonetheless, Super Junior’s somewhat artistic qualities never fail to make an appearance during Super Show runs.Donghae previously unveiled his virgin self-composed track “Beautiful” (during SS2), as well as a collaboration song with One Way’s Chance, “I Wanna Love U” (during Super Show 3). This time however, after contributing two or three songs to Super Junior/Super Junior-M’s discography, Henry was the one to have a new self-composed song, “Cold,” included in the setlist! The inclusion of Siwon is random, however, and his ineptitude with the choreography makes him stick out like a sore thumb. Generally speaking, although Henry’s passion for music and his pursuit of artistry can’t be questioned, his self-composed songs — although never bad — have ranged from being slightly generic at worst, to guilty pleasures at best. Most of the time it’s both. “Cold” however, is definitely Henry’s strongest up-tempo to date. Although it’s definitely not particularly re-inventive (but honestly, what pop song is? ), and leaves much to be desired in terms of polishing, it’s a strong track. It carries its crisp and frosty pop sound well, and although not completely memorable, is immediately likeable on first listen. Even the dubstep slots in reasonably well! Henry has a bright future ahead of him as a producer, and it’s thrilling to watch him grow with every release. 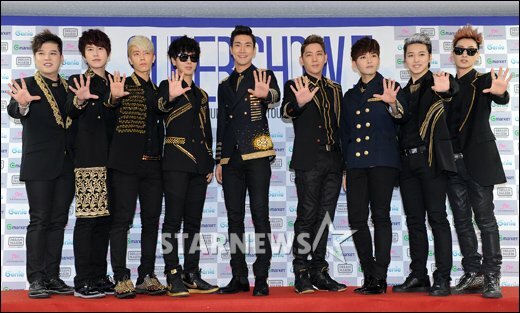 All in all, Super Show 5 was a big affair. But really, the greatest highlight of the entire show was just the sheer amount of Henry and Zhou Mi included within the setlist. A good amount of songs performed were from the newest Super Junior-M album, and the two M members were included in VCRs as well as quite a few of the core group items. During the Naver Line chat, the other Super Junior members openly acknowledged that Zhou Mi and Henry were in unfortunate and sad predicaments during their last few Super Shows. It seems like there’s a slow integration of Henry and Zhou Mi into the core group, and it’s all been building up to this for a while now. How? When? What does this all mean? All of these questions will be answered in part two of Seoulbeats’ SS5/Super Junior coverage!